Get Your Digestive System Back. 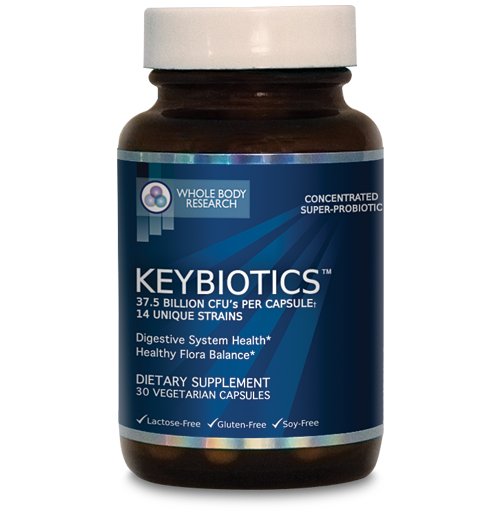 Keybiotics is a total gastro-intestinal rejuvenation system, scientifically formulated to contain 37.5 billion CFU. Copyright ©2011- Whole Body Research, LLC . All Rights Reserved. These statements have not been evaluated by the Food and Drug Administration. This product is not intended to diagnose, treat, cure, or prevent any disease. This product is not intended for those with a medical condition. Use only as directed. Consult your physician before beginning any prescription drug. Consult your pediatrician before giving Keybiotics to children under 18 years of age. Free shipping is to the United States only.